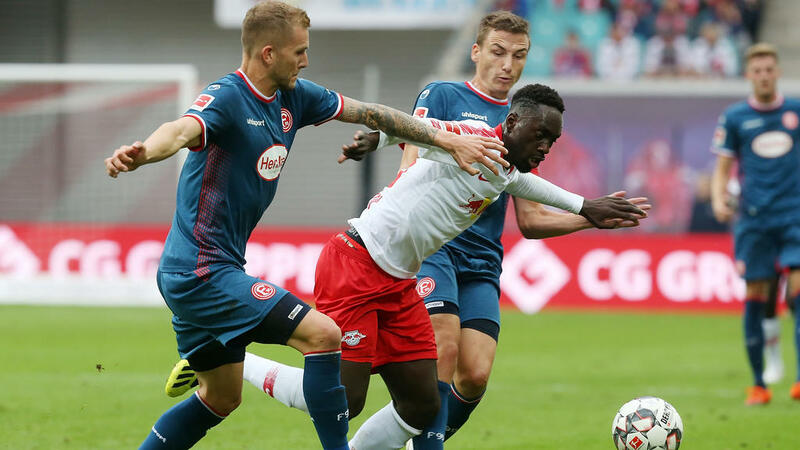 Jean-Kevin Augustin spared RB Leipzig's blushes as his second-half equaliser secured a 1-1 draw with Fortuna Duesseldorf on Sunday, but Ralf Rangnick's side remain without a win after two Bundesliga games. After a heavy defeat in Dortmund last week, Leipzig were facing a nightmare start to the season when Matthias Zimmermann fired Duesseldorf in front, before Augustin rescued a point for the Europa League side. "I think they underestimated us today," Zimmermann told Sky. "We played brilliantly going forward, and created a lot of chances. Sadly, we lost two points in the end." Leipzig made a nervy start to the game, and Marvin Ducksch squandered a gilt-edged opportunity to put Duesseldorf ahead after just six minutes. Half chances fell to Bruma and Timo Werner as the home side settled, but Fortuna remained dangerous swarming forward on the counter-attack. Augustin found the net for Leipzig just before half-time, bundling in the rebound after Emil Forsberg had stung the palms of Fortuna keeper Michael Rensing. The Frenchman, though, was ruled offside. Duesseldorf wasted no time after the break and took a deserved lead on 47 minutes, Zimmermann linking up with Niko Giesselmann to sweep the ball into the bottom corner. The home side responded with tenacity and were rewarded on 68 minutes, when Augustin picked up a loose ball in the box and prodded it past Rensing. Matheus Cunha came within inches of scoring a brilliant winner for Leipzig ten minutes from time, but his overhead kick bounced just the wrong side of the post, before Ducksch forced a flying save from Peter Gulacsi at the other end.